Auctions are a lot of work! There we said it. However, auctions are popular with guests and give them something to do at the event; and, they raise money! So if you are going to do an auction (and we recommend you do), what types of tools or technology can you use to make it easier to setup, manage and execute your next silent auction? Auction planning tools have a range of capabilities that allow you to collect donations throughout the year, organize those donations in a database, send out donation receipts to item donors, and package those donations together for including in the silent auction. Prior to mobile bidding, these tools would normally generate paper bid sheets that you would put out in the auction area. To help bidders understand the item details, planning tools often also allow a manager to print out pre-formatted display sheets or auction item catalogs. More recently, these planning tools have been integrated with auction bidding tools to create a seamless transition from auction planning and set up to auction execution. We have discussed the challenges with paper bid sheets in previous blog posts quite a bit. Outside of the fact that paper bid sheets limit your guest's ability to bid, they are an administrative burden for your team that has to print them, distribute them, monitor them (yes, people steal them and manipulate them), decipher them, and then collect them at the end to tabulate results. Auction bidding tools replace bid sheets, with mobile bidding being the most common (and popular) method today. Several years ago, before smartphone adoption was high, the most prominent auction bidding tools tended to be devices that a charity would rent from the bidding company. Bidders would either be handed a personal device to use, or they would be given a card (like a hotel key card) that would identify them. They would insert that card into a stationary bidding device to check and place bids. These tools would automate the bidding process and eliminate the mistakes often seen with reading handwriting on paper bid sheets, but they still required bidders to be physically present in one area to bid. 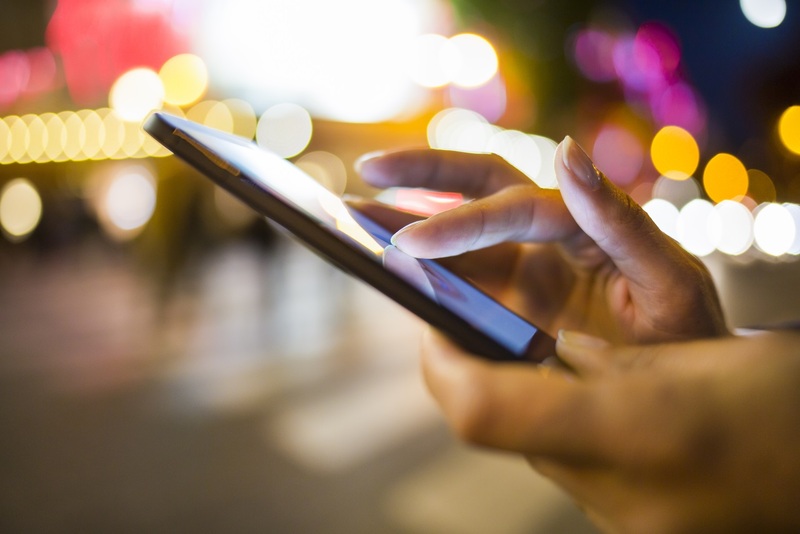 Mobile bidding eventually started to gain traction, starting with text-based bidding. With text-based bidding, bidders would text in their bids. If their bid was high enough, it would be accepted, and they would receive a text response acknowledging their winning status. If their bid was not high enough, they would be prompted to try again. Prior to smartphones and adequate venue WIFI, text was the only way to bid from a personal device. However, when new smartphone-based solutions came onto the market, tools emerged that allowed bidders to bid on their device from a webpage. This put users that bid via text at a distinct disadvantage. Smartphones were connected to the internet and could post bids directly to the auction server instead of relying on the mobile carrier. The problem early on was that few guests owned a smartphone, but over time that issue has largely been eliminated. Today, nearly every guest attending a charity event is bringing a smartphone with them, and over 90% of them are an Android or iPhone device. Today, mobile bidding software solutions are primarily web-based solutions. With these, a user is given a link to tap on or a web address to type into their smartphone’s browser. This address directs the user to a web page where they can register and bid in the auction. 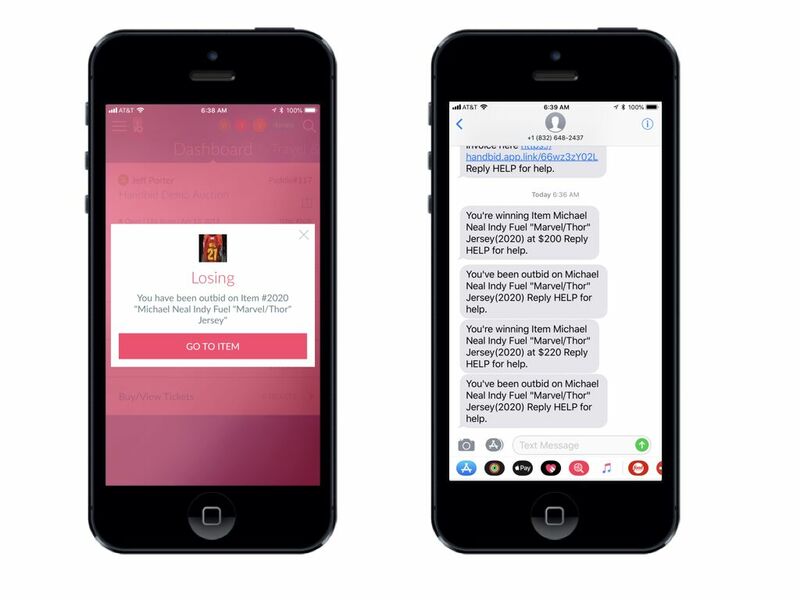 If a user is outbid, the mobile bidding system will send them a text message. Sounds easy enough, right? What can be better than this? Well, we're glad you asked! Most mobile web interfaces are merely paired down derivatives of a bigger website. The mobile bidding software company builds a regularly sized webpage for a desktop computer and then uses some technology methods to make that same size “fit” on a mobile device. This results in a shrunk-down design that was not originally laid out for a mobile user: buttons are small, text is tiny, and the navigation is complicated. Mobile website solutions rely on SMS to communicate back to the user. Therefore, these solutions don’t work well (really, don’t work at all) in situations where the device has no cellular data connection but can still connect to WIFI. Mobile website are less engaging for the user. Research shows that smartphone users spend more time in apps vs. websites on their phone. Why? Because apps keep a user engaged. They are more responsive and interactive. Native apps are faster, more responsive and create the most “real-time” bidding environment possible. 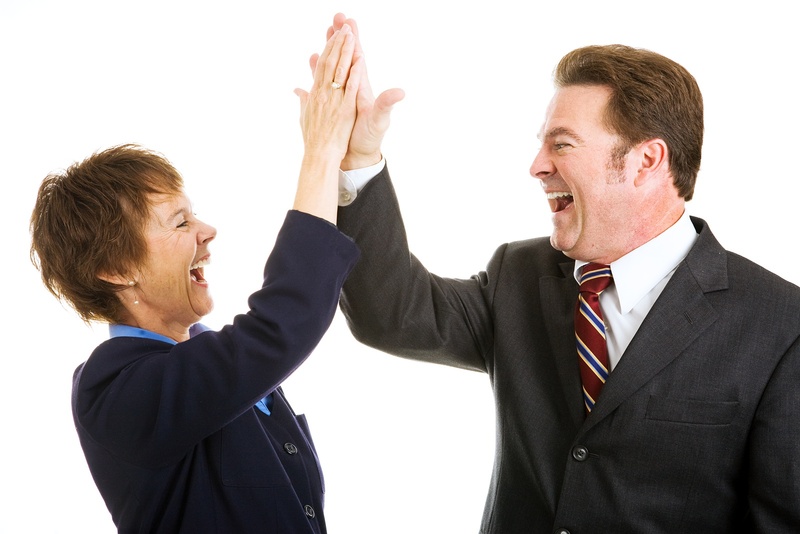 If you want to keep your bidders engaged, them give them an engaging interface to use. Native apps allow the mobile bidding system to connect directly to a device and not rely solely on SMS. Native apps can send what are called PUSH messages directly to the phone. These are digital messages that connect from the server directly to the device over the Internet and work even when the device has no cellular coverage. Also, PUSH messages can be configured to vibrate the phone and play sounds (something an SMS cannot do). Why does that matter? Because a customized sound can let a bidder who is not looking at their device know exactly what the message is about. All incoming SMS messages sound the same on a device. But all PUSH messages do not have to. Native apps give you, the auction host, a presence on the user’s device. With a web solution, once the auction is over and invoice is paid, the auction is forgotten by the user and the device. This is not true with a native app. The vast majority of users do not delete apps after they install them. This allows you to maintain a presence on the device and to reconnect with users on an on-going basis. Plan on running multiple auctions per year? Please understand that a native app will allow you to easily re-invite your former bidders to your next auction! The actual bidding process for Handbid. 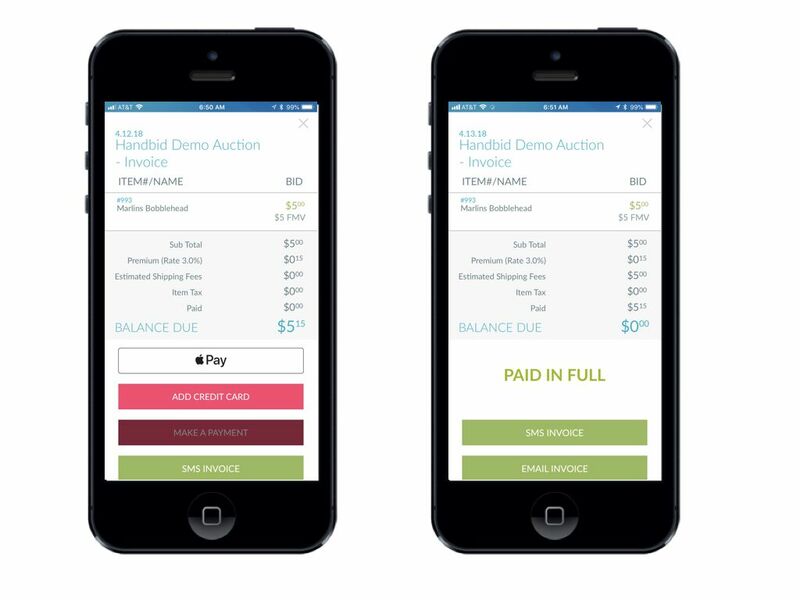 The phone on the left shows Handbid's in-App experience, and the other shows a web-based bidding experience. Native apps will keep the user in one location, while web solutions require users to exit the app to view SMS notifications. Before we close out this section, we suspect you have some concerns about whether native apps are too much hassle for your event. So let’s address that now, especially since our flagship interface is a native mobile app for bidding (we also have a web interface as well). My guests are old and not tech savvy; they won’t know how to use a native app. Apps are often easier for non-tech savvy users to operate than a web page, especially those shrunk-down websites that are difficult to see and navigate. Apps allow you to take advantage of the accessibility settings on the device. For example, Handbid’s native app reads a user’s device settings and will adjust font size, contrast and button formats based on what the user has put into their device preferences. Most guests who won’t use an app won’t want to use the web on their phone either. Those non-techy guests are best off bidding from a tablet with the assistance of a bid helper. Handbid has an app for iPad that serves this purpose well. What if the user can’t remember their password? We all forget passwords from time to time, but thank goodness they are easy to recover. But recovery methods aside, this issue is more of a fear than a reality. Having helped thousands of bidders setup Handbid on their phones, we have seen this issue largely disappear. Years ago, it was the guest calling their son or daughter to get the iTunes password. Today? These guests are downloading apps with a fingerprint or a quick look at their face (thanks Apple). Our first question when we hear this often is, “how do you know?” This may sound presumptuous, but we think we know the answer. The answer is an overwhelming “yes; they will.” We go to a lot of events, and we have had thousands of conversations with thousands of bidders. Based on that experience, what we can tell you is that 99% of the time, your guests will follow whatever instructions you give them. For those that are not sure how to follow those steps, they often will hand you their phone to get them set up (so have a few high school or college age kids around that are app installation experts). When we do events here at Handbid or train our users, we encourage them to get their bidders to bid from the app. We find the app will generate more engagement, more bids, and more revenue for your guests. Engagement is key. If your bidders don’t stay connected to your auction, they won’t continue to bid in it. However, Handbid offers both a web and app version of the software for those that want (or need) that choice. No one else offers that combination. The last section of tools have to deal with closing the auction, calculation of winners, generation of invoices, and collection of payments. Prior to software, managers had to collect bid sheets and collate them by winning bidder into a pile that they could then have available at checkout when the bidder arrived. These sheets would be hand entered into an adding machine to determine the total price owed. Depending on the size of the auction, this could take over an hour! Once the auction closed, managers would enter in winning bids into the software. The software would then calculate winners and generate invoices. Hanbdid's Checkout Process - Quick and Easy for you and your guests! More recent mobile bidding solutions have integrated the calculation of winners and invoices into their interface. Users can store their own card on file from their device and then review and pay their invoice directly from their phone. By allowing users to review and pay from their phone, checkout lines have largely been eliminated in most auctions. Native apps have the added advantage of allowing users to also pay with integrated payment solutions on their phone (such as Apple Pay or Android Pay). These solutions are simple and have proven to be very popular with users. If you are in the market for software, we hope this article has given you some insights into the types of solutions out there. Handbid handles most of all three of these areas in an integrated solution that allows you to manage your auction from start to finish. If you are interested in a demo of how this works, please click the button below and we will get something scheduled!